This post may include affiliate links. See my disclosure policy here. The average restaurant meal outside of the home in the U.S. cost around $10 per person. In my area, restaurant meals during lunchtime cost anywhere between $5 to $7+. If you order food for lunch nearly every weekday, you’ll easily spend more than $1500/year just by eating lunch. I don’t know about you, but I can find a much better use for that money. That extra money can go toward savings, paying off my debt, needs for our home, a possible vacation and so many other important areas of my life. If you want to save money on expensive work lunches and use the savings elsewhere in your budget, here are some tips. Whenever I go grocery shopping, I consider which food items I’d like to buy for my lunch to avoid purchasing anything during the workday. I plan ahead and work lunch items into my monthly food budget by utilizing sales, implementing easy recipes with simple ingredients and getting creative. Using coupon and deal apps like Ibotta, Checkout 51, Raise and ShopKick often comes in handy. Whether your household is small or large, you may have quite a bit of leftovers throughout the week. Instead of tossing the food, take it to lunch the next day or create new meals with what you have. 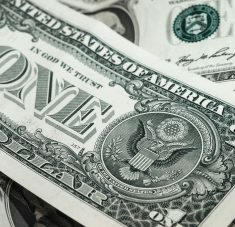 I explain how to create a leftover makeover in tip 2 of an article I wrote for Personal Finance Expert Clark Howard’s website. Could you shred last night’s chicken and add it to a salad or add some beans, corn and salsa to create a burrito bowl? Be sure to always take an updated inventory of what’s in your cabinets so you can create quick and easy lunches without having to dine out. If you need ideas, check out Pinterest or find cookbooks that focus on making different meals out of leftover. I swear by Robin Miller’s Quick Fix Recipes. I enjoy her chicken recipes because they’re unique yet still easy to make. If you’re looking for a twist on a familiar meal, this book is for you. She’ll start off with the main recipe and includes the total amount of time needed to make it. The main recipe is the first one you’ll make and then she’ll show you how to “morph” it into other tasty recipes. Then she’ll follow up with three different recipes to transform the original meal into 3 different meals. 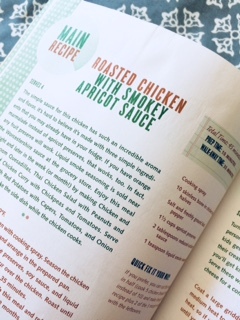 Here the main recipe was roasted chicken and apricot sauce. 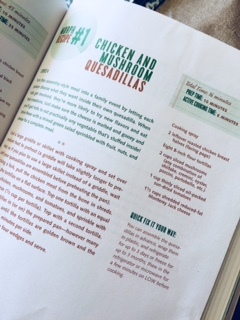 She then suggests to turn it into chicken and mushroom quesadillas. You can always add or subtract ingredients to your liking. I just like having something new to try with the same ingredients without actually having to eat the exact same thing. I also like taking all of the decision-making out of deciding what to make. Here’s what the cover of the book looks like. It works best for those that like to save money making quick meals . Snacks keep me going throughout the day. If you commit to bringing your lunch to work but forget about snacks, odds are you may catch yourself running out to the nearest store to pick some up. Decide what you want your main two snacks to be throughout the week to help get you through the day without feeling the need to run out to the store. I rely on Aldi because most of their snacks are dirt cheap and I don’t mind generic brands. You can also buy in-season produce or make your own granola to pair with yogurt for healthier options. Wait, this isn’t a food tip?! Sometimes, it’s common to want to go out for lunch just for the sake of getting some air and getting out of the house or office. Even if you get that antsy feeling that you have to move all the time, spending big bucks on fast food each day is still not the answer. You can still pack your lunch and get some air away from work whether it involves going for a quick walk, running some errands, going to wash or vacuum out your car, or stopping by your house if you live close enough (or a friend’s if you work from home). I recently heard an excellent podcast episode on Journey to Launch with one of the co-authors from Your Money or Your Life. Vicki Tobin has fully revised and updated this best-selling book that promises to transform your relationship with money and put you on a path to financial independence. She goes into a profound explanation about spending money and how the happiness factor that comes with shopping follows the law of diminishing returns. 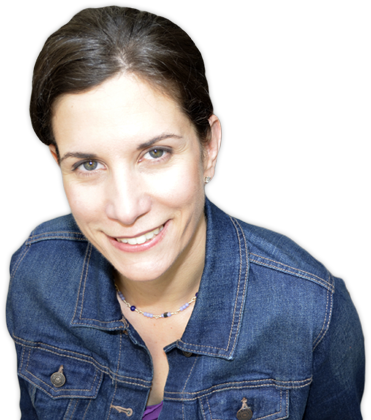 She also unpacks many other knowledge bombs to help you get a deeper understanding of our behaviors surrounding money. Everything you do and spend money on in life should have a value. If you value many other things and experiences over buying work lunches, it should be easier for you to adopt the habit of bringing your lunch regularly.